Easy tracking of KPI in warehousing. Saving money thanks to increased productivity. Warehouse Summary is a comprehensive overview of warehousing KPI that the client wishes to track. 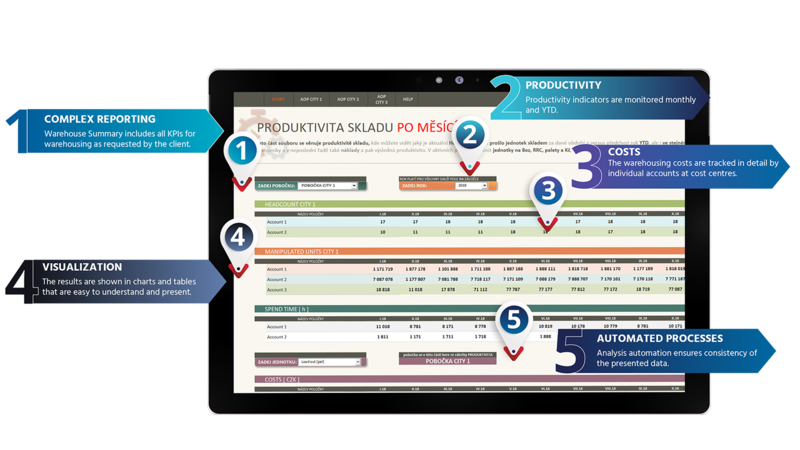 On just a few worksheets it interprets information on costs, warehouse productivity, financial plan implementation and many other indicators. The outputs are well-arranged and visualized so that they are easy to understand for all types of users. The report works on a monthly basis. We manage the report and update it on a regular basis for our clients. The cost of warehousing forms a large part of the logistics budget of many companies. The company´s management often focuses on warehousing and constantly seeks ways to make warehouses more efficient and cheaper to operate. In order to make this happen it is good to know how things work at the moment and how they worked in the past. 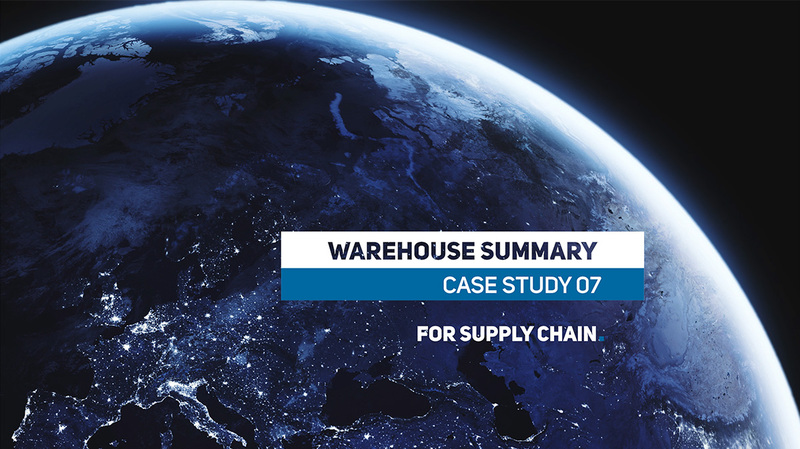 The possibility of saving money with increased productivity and optimizing warehousing costs inspired the creation of Warehouse Summary. It is a tool for tracking all important warehousing KPI. Warehouse Summary works in the environment of MS Excel. This is an advantage for any user because Excel is nowadays commonly used in most offices and every office worker has at least little experience with it. The file has a service section and presentation section. The service section is there for automated processing of input data from both data systems and accounting of the client and also for calculations of indicator values. The outputs are available in the presentation section where they can be found in a well-arranged and easy to read form. The client has more warehouses which need to be tracked. To track a particular warehouse, the user just sets the criteria in selection field, and all the available data is displayed within seconds. The user can also select from various units of measurement. The most important indicators monitored by Warehouse Summary include the current costs on individual warehousing accounts and their comparison with the operational plan. Specific accounts with the highest savings as well as accounts with highest overdraws are shown in the overview box. This indicator is key for financial planning for the upcoming periods.. Furthermore, Warehouse Summary monitors productivity indicators of individual warehouses in simple overview tables and charts. This is where the client clearly sees in numbers how the changes or challenges that the warehouse has encountered have manifested themself in the cost of manipulated unit. Both the client’s logistics network and its storage process model have changed several times during the Warehouse Summary. Of course, we also took this into account in the Warehouse Summary, either by changing the computational part of the file or by adding a new module. KPI reporting solutions are an important part of our services. For our clients we have developed a number solutions, such as Operations Summary or Customers Summary. We have also lots of experience with analysis and development of solutions for warehouses. We can name for example Application for Tracking of Daily Productivity of Workers or Supply Management Tool.